New Years – Central Park – Começe o ano correndo com o pé direito, de bicicleta, ou patins! 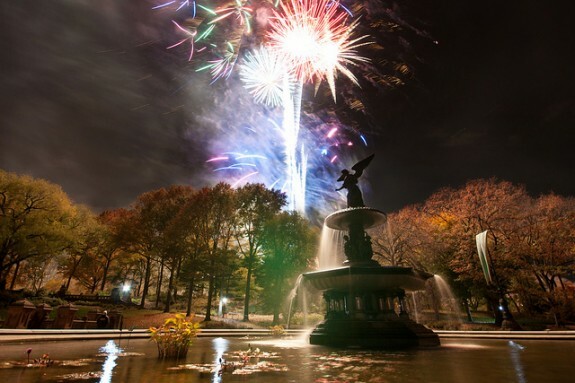 Venha comemorar o Ano Novo no Central Park! Se você pensa que o Central Park serve apenas para o uso durante o dia, e que os fogos de artifício só acontecem no dia 4 de julho, voce esta errado.Durante os últimos 30 anos, o clube de corredores, New York Road Runners, organiza uma entrada do ano muito diferente. Eles oferecem varias atrações no Central Park, a partir das 22:00horas. É uma noite muito animada e muito engraçada. Os participantes da corrida vem fantasiados e, para animá-los, muitas gente oferece taças de champanhe para os corredores conforme eles passam pelas transversais do parque. Fica aqui a dica para voce curtir o ano novo economicamente, divertido e saudável. Feliz Ano Novo! If you thought Central Park was only for daytime consumption and that fireworks were mostly for July 4th, you are wrong. And, for the last 30 years, the New York Road Runners Club has organized a New Year party, hosting many activities in Central Park starting at 10 pm. No matter the weather or the temperature, the Park is taken over by people of all age, in costumes, dancing and general merry-making near the Central Park Bandshell (just south of the 72nd Street transverse, nearest park entrance is at Fifth and 72nd). Right after a spectacular blaze of fireworks, the Midnight Run starts at midnight, for a 4 miles run thru the Park. Many of the runners come in costume and, the crowed watching often offers a glass of champagne as they go by. Have a Happy and Healthy New Years! Posted on December 31, 2014 December 31, 2014 Categories Blog, EnventosTags Ano novo, Bandshell, Belvedere Castle, Bike, bike ride, Central Park, Champagne, Ciclismo, ciclye bicicleta, dance party, midnight run, new years, road runners, runners, saudavel, silvia matera gerber, Washington SquareLeave a comment on New Years – Central Park – Começe o ano correndo com o pé direito, de bicicleta, ou patins!